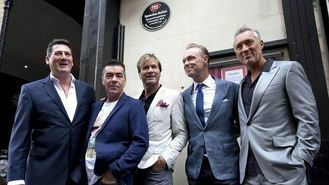 Spandau Ballet have returned to their roots as they visited the site of their very first gig to see a plaque unveiled to commemorate their debut live show. The band, who will reunite on stage later this month at the screening of a new film about their career, were at what was the location of the New Romantic hang-out The Blitz Club in London's Soho. The group - made up of Tony Hadley, Steve Norman, John Keeble and the Kemp brothers, Gary and Martin - played their earliest show at the venue on December 5, 1979, and making enough of an instant impact to be offered a record deal on the spot. At the time it was known for its trend-setting clientele - who were known as the "Blitz Kids" - and who included Steve Strange, later to find fame with Visage, and the DJ Rusty Egan, while others who frequented the place were designer John Galliano, Boy George and Marilyn. The audience for Spandau's debut is said to have included punk figures Siouxsie Sioux and Billy Idol. To mark the site of their performance, the group attended the unveiling of a PRS for Music Heritage Award outside what would have been the entrance to the club, which had been conveniently located - for London's bright young things - between two leading art schools. Spandau guitarist and songwriter Gary Kemp said: "The Blitz was an incredible melting pot of music, fashion and creativity. It's not just Spandau Ballet that owe our career to that place at that moment in time. "Musical icons such as Chris Blackwell and David Bowie all came to The Blitz to check out what was going on, the place was that important." Spandau - whose hits included True, Gold and To Cut A Long Story Short - follow the likes of Blur, Dire Straits, Squeeze and Status Quo in having their debut gigs celebrated. Guy Fletcher, who chairs performing royalties body PRS, said: "The Blitz Club was the beating heart of the New Romantics movement that propelled some of British music's most successful artists to stardom. Spandau Ballet are currently riding a fresh wave with the release of their new album and film, and it's very fitting that we should bring it all back to where it began today - what a story." Lady Gaga has said Tony Bennett "saved her life" when she was so fed up she wanted to quit singing. Friends and music stars have paid tribute to former Primal Scream musician Robert "Throb" Young, following the guitarist's death. McBusted are set to get their own documentary film in the style of One Direction's This Is Us. An A-list audience watched Britain's king of the downloads Pharrell Williams perform as he heaped praise on his fans for "lifting me so, so high". Damon Albarn's solo debut and chart-topping duo Royal Blood head the shortlist as favourites for this year's Barclaycard Mercury Prize. Avicii has cancelled all of his upcoming shows for health reasons. Jennifer Lopez and Nicki Minaj treated fans to a battle of the booty as they both showcased their behinds at the Fashion Rocks concert. U2 have surprised fans by giving away their first new album for more than five years to people around the world. Bruce Dickinson is set to take to the skies as a German fighter pilot as part of First World War commemorations.